Could a Romantic Holiday Card You Make Still Convey Passion without Words? Want to make a romantic holiday card but not sure what to write on the cover? Why not write nothing? True. Your Xmas greeting card doesn’t need words to be romantic. It simply needs the expression of affection. Hence, the love symbol will do the trick. However, for this card, the romantic delivery doesn’t stop with the heart silhouette. Can you guess what else it's got? Yes. It also has a romantic greeting card art. In other words, the love Christmas card art depicts a couple in love snuggling in the cold winter snow. And you don’t have to stop there. Check out the tips below for more. Even though there are no words on the cover, the art speaks for itself. And that puts this project in the realm of unique cards. Did you notice the two cuties in love? Changing the card theme from Christmas to wedding anniversary is also one of the many ways to create unique cards. Besides, this is a cool card for a couple that got married around the winter Christmas period. Also, replacing the holiday ribbon with a wedding one will make it much obvious. Happy Wedding Anniversary My Love. Create the greeting card art on the 4.5” x 5.5” white cardstock with the romantic Christmas rubber stamp and black ink pad. Use the colored pencil to complete the greeting card art. 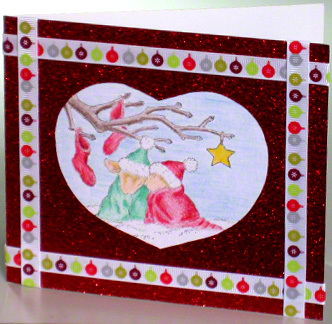 Score and fold the 5” x 12” cardinal red glittering cardstock into a 5” x 6” card. Draw a 3" x 4" rectangle in the center of the romantic holiday card. Then draw a heart shape inside this rectangular box. Cut out the heart shape from the card to create a heart shaped window. Since the goal is to create the window, you may not need the final cut-out-shape itself. Hence, the cut could be faster with a pair of scissors. glue the holiday ribbon around the glittering cardinal red cardstock. Place it in the middle of the 1” gap between the edge of the heart shape and the edge of the folded card. Finally, glue the white cardstock so that the greeting card art fits in the middle of the heart shaped window. Want more expressions of affection on this card? Then feel free to go a step further and add some heart ribbons. Or, better still, replace all the Christmas ribbons with love ribbons. As you must have guessed by now, using love ribbons is not the only way to subtly take the card to the next level. So, what other ways can you add expressions of love into your romantic holiday card without using words on the cover?